This work is part of the Student Guides series. It offers fascinating Bible facts. This work is also packed with charts and figures. About "Bible Facts and Figures (Essential Bible Reference Series)"
How many double-decker buses could have fit into Noah's Ark? Which Bible character is mentioned most times in Scripture? Where should you look in your Bible when you need peace? Who were the judges of Israel, and what did they do? 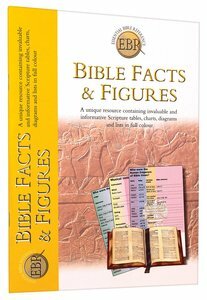 Answers to all these fascinating questions and many more are to be found in this treasury of Biblical information, designed for beginners, but useful for all students of the Bible. Dr Tim Dowley (Ph.D., University of Manchester) is a historian, and a prolific author and editor of Bible resources for adults and children. He has also written popular biographies of J.S. Bach and Robert Schumann. This title presents valuable introduction to the Bible as a whole, explaining key elements, such as why there are two Testaments, how people lived in Jesus' time, and the importance of the Dead Sea Scrolls. Contents include time charts, colour maps and diagrams, and a brief list of who's who. What did Mary and Joseph's house in Nazareth look like? What sort of boat did the fishermen Peter and Andrew sail? How did Luke the physician help his patients? This title answers these and other questions about life in Biblical times. It is suitable for children of age 7-9 years.